Lace up your sneakers and hit the trails, Cornwall and Stormont, Dundas & Glengarry have a route for every runner. Running has become a popular activity for people of all ages, and each runner is usually looking for the same thing – a safe route that will circle back to the starting point, with points of interest along the way. Fortunately, every hamlet and village can offer runners a unique experience. The Waterfront Trail connects the entire region with a paved route along the St. Lawrence River. The route in Cornwall is completely separated from the roadway, offering scenic views away from automotive dangers. The City’s recreational path also extends for another 35 km throughout the city. 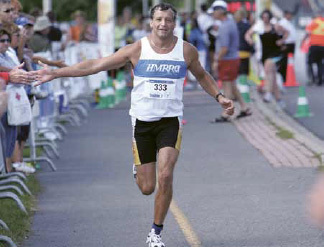 In South Stormont, runners can head out on the Long Sault Parkway which connects 11 small islands. For those looking for a more natural experience, head out onto the trails at one of several conservation areas. These trails are often a mix of forest floor and built surfaces, and have defined short, medium and long loops. Races are a popular way to measure your progress and speed against other runners. 5k races and friendly duathlons are held throughout the year. The larger organized events include the Run to end MS Marathon which attracts over 600 runners and the Cornwall Triathlon which attracts over 500 participants. The Cornwall Multisport Club is a local club that helps promote the sport of running as well as putting on events throughout the year. Check in with them if you are looking for running partners!